The terms softwood and hardwood do not refer to the density of the wood, but rather the type of tree that the wood comes from. 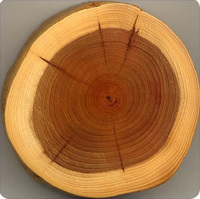 Hardwood comes from angiosperms and softwood comes from gymnosperms. Therefore, the porous and easily scored balsa is hardwood but the dense and hard to work yew is softwood. Within both softwood and hardwood there are some varieties of wood that are of a higher quality than others. Redwood, with its natural insecticide properties, is prized over pine, and lustrous mahogany over spongy balsa. In general, however, hardwood is a more costly wood than softwood. This is because hardwood trees grow individually within large stands of different types of trees. For example, to harvest mahogany one may have to trek for many miles with the rainforest before finding a suitable tree. On the other hand, in the western United States, stands of pine trees can front a highway or rail line for twenty miles or more. Manisha Kumar. "The Difference Between Softwood and Hardwood." DifferenceBetween.net. September 18, 2009 < http://www.differencebetween.net/miscellaneous/the-difference-between-softwood-and-hardwood/ >.